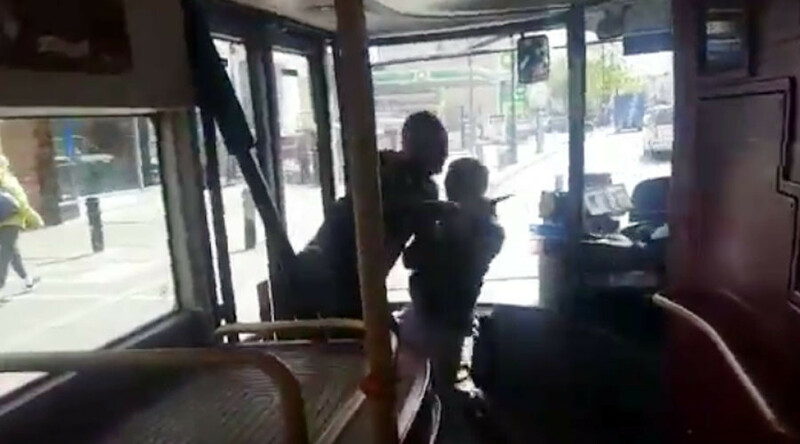 A Londoner has been hailed a hero after wrestling a knife out of the hands of a man who stormed a bus on Tuesday afternoon. The scene was filmed by a fellow passenger on the No. 149 bus, which was passing through Stoke Newington when a man in a hoody entered holding what looked like a large kitchen knife. The unnamed hero is seen wrestling the armed man barehanded and disarming him before he has the chance to flee. “I’m an African. You’ll never take my life,” the victim shouts at the assailant as he dashes at the end of the footage. It is unknown whether the two men knew each other or whether the knifeman had made his full intentions clear. The brave man was left with cuts on his hands. “Officers and London Ambulance Service attended and found a man in his 20s with minor lacerations to his hand and head,” a spokesperson for the emergency services said. The public showered the young man with praise across social media. “That is some real guts there. Going up against a knife barehanded almost assures getting stabbed,” said one user. “Wow! Brave man tackles knife-wielding thug in bus,” user Daniel Jr also tweeted. The incident followed news from the Metropolitan Police that there’s been a hike in knife crime in the British capital. Over the past year incidents relating to carrying blades increased by nearly a quarter, from 9,742 to over 12,000. The Met suspects the rise is linked to a greater need for self-protection. “Young people carrying knives are doing so for a variety of reasons including status, criminality and self-protection, but only around a quarter are affiliated with gangs,” the Met’s assistant commissioner, Martin Hewitt, said in a briefing on Wednesday. Earlier this week a 27-year-old woman was left fighting for her life after being stabbed in the early hours, also in Stoke Newington. She was saved by a driver from the No. 243 bus, who jumped out of his vehicle to call 999.